The Turkish regime may have scored many PR points by opening its doors to millions of Syrians, but it can’t do much more than simply allow them in. The refugee camps have been in terrible shape and people have had to beg, or work low-wage, low-security jobs in the inner cities.(... )The increasing presence of Syrians has already had a corrosive impact on Turkish society…The unwelcome spread of the refugees has further polarised an already polarised society. Turkey opened its borders for Syrian refugees and has maintained an open door policy since 2011. 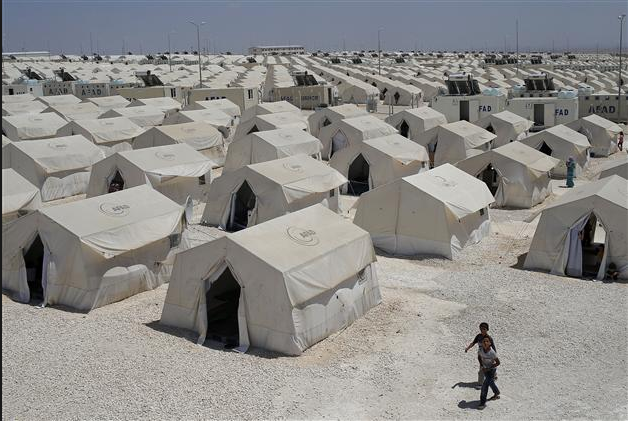 Turkey currently hosts 2.7 million Syrian refugees.2 272,000 refugees are hosted in 26 temporary protection centers (camps) in 10 different cities.3 Other refugees are residing in cities of all over Turkey. In the camps, refugees are provided with food, health services, security services, religious services, educational services and social facilities. All camps have hospitals, areas for courses and areas for sports activities, kindergartens and schools.8 Facilities such as a sewage system, water-supply system, prefabricated toilets and showers, dishwashing units and laundries, TV and internet halls, grocery stores, and places of worship were established at the camps. With monetary aid distributed at the camps each month, all Syrians are able to shop for any food and cleaning items they need at grocery stores. For adults, weaving, hairdressing, tailoring, computing, handcrafts, Turkish, Arabic, and English literacy courses are provided in the camps. In December 2014, a report about integration of Syrians in Turkey was published by Hacettepe University’s Migration and Politics Research Centre.14 A survey with 1,500 Turkish citizens from different provinces and in-depth interviews with Syrians outside the camps were conducted. The survey concluded that the level of social acceptance of Syrians by Turkish society was high. The 64.6 percent of the Turkish citizens supported a proposal to accept “Syrians without any discrimination regarding their language, religion and ethnic background as a humanitarian obligation on our part.” Interviewed Syrians expressed that they are content to be in Turkey and that Turkish people hosted them very well. They stated that they desire the right to work that they will no longer be a burden for Turkey. Regarding the issue of “Syrian beggars,” interviewed Syrians expressed these beggars are not the impoverished people coming Turkey, but rather they are organized gangs who were begging in Syria as well even before the war. They also uttered their discomfort towards beggars influencing the perception of Syrians in Turkey.